Here's a card with this weeks freebie image.. I used some of the Papermania Hanoverian papers - they are so gorgeous and so girly. I coloured her in with promarker pens adding little bits of white gel pen for highlights and a stardust clear glitter pen.. oh and I added some clear glaze pen to her red boots.. 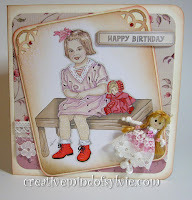 I was inspired by a very old vintage photograph of a little girl for this week's freebie. I hope you like her. I haven't made a card yet but hope I will get the time tomorrow. I would love to see what you create with her. here she is - click on her to open up a large jpeg 300 dpi image. Thank you very much this is such a beautiful image! Thank you for digi. I can not wait to color her. OMGoodness Sylvie!!!! She is so pretty. She is such a sweetie with her little doll by her side....thank you!! She is just adorable. When I was about 3, my parents had a photographer take my picture sitting on a bench. This looks so much like my picture minus the doll. Thank you so much! This is lovely, as usual! You have a wonderful talent! Beautiful - thank you very much. She is just precious...thanks for sharing with us. Such a sweet little one. Thank you so much! She is a cutie! Thank you for sharing her with us. What a fun image.. Thanks. Thank you for the sweet Digi. Thank you, she is gorgeous. I got some freebies from your blog I wanted to say thank you and you do beautiful work. Thank you so much for the freebies. I can't wait to use them. What great talent. She is so adorable! Love your images. Thank you so much for sharing them with us.